From July 2010 to July 2011, 23 states have seen statistically significant increases in employment, the Bureau of Labor Statistics recently reported. Texas saw the most positive gains with 269,500 new positions filled, followed by California with 189,600, and New York with an additional 106,600 positions. Ohio was also in the top four, with an employment increase of 74,100. 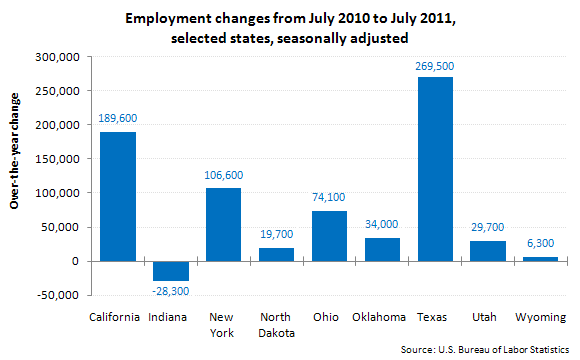 Only one state saw a statistically significant decrease in employment over the year, Indiana with 28, 300 jobs lost. The largest over-the-year percentage change in employment took place in North Dakota, with a 5.2 percent increase. Texas had a 2.6 percent increase, Utah with a 2.5 percent increase, and Oklahoma and Wyoming both experienced a 2.2 percent increase. The largest over-the-year percentage decrease in employment occurred in Indiana at 1.0 percent. While employment numbers are moving in the right direction, many economists fear that jobs are not returning fast enough. Long after the recession officially “ended,” there are still 9 states with unemployment rates over 10 percent as of July 2011. The following states have unemployment rates at or above 10 percent: Nevada at 12.9 percent, California at 12.0 percent, Michigan at 10.9 percent, South Carolina at 10.9 percent, Rhode Island at 10.8 percent, Florida at 10.7 percent, Georgia at 10.1 percent, North Carolina at 10.1 percent, and Alabama at 10 percent unemployment.